Product Description: An advanced waterborne alkyd fortified with polyurethane and containing durable light fast pigments. 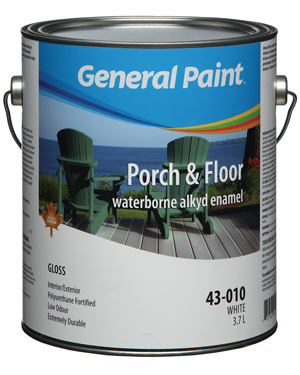 Intended Uses: An Int/Ext gloss coating for properly prepared wood or concrete porches, steps, decks and floors. This advanced waterborne alkyd blend has been fortified with polyurethane ensuring to provide a finish that is very tough, abrasion and water resistant. Surface Preparation: Surfaces must be clean, dry & free from dust, grease, mildew & wax. Remove any loose & peeling paint and repair with patching compound. New Wood or Drywall: Seal bare surface with appropriate Latex, Hybrid or Alkyd primer for better uniformity.Previously Painted Areas: Glossy surfaces should be sanded to a dull finish or prime with an appropriate primer to provide good adhesion. Extra Notes & Exterior Application: Wood must have a moisture content below 18%. Concrete must have a moisture content below 12%. Concrete should cured 30 days minimum (including repairs); treat surfaces with a solution of muriatic acid & water, rinse and let dry 2-3 days to dry after washing. (Surface should feel like 120 grit sandpaper). Reduce first coat 10-15% and apply second coat full strength. Product Description: A modified acrylic latex, pigmented to dry as a tough, water resistant, flexible finish. 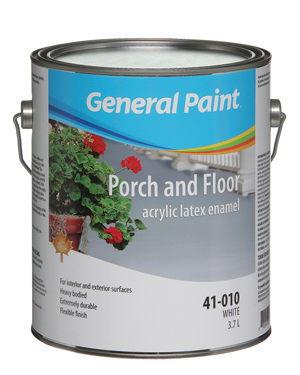 Intended Uses: A tough flexible coating for new or previously painted wood or concrete floors, porches and stairs. May also be used as a top coat or to freshen up decks or floor surfaces previously coated with Hypalon or Latex Spantex Deck Coating.